On Thursday, August 28th, the City of Mississuaga opened the new Confederation Parkway Bridge, which links the Mississauga City Centre to the neighbourhoods north of Highway 403. The Google Map of the area still does not show the new bridge, but you can figure out where it is by drawing a line over the 403 at Confederation Parkway. 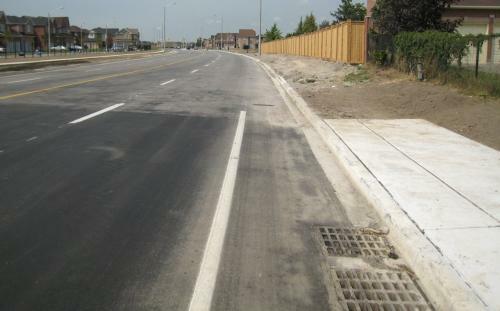 So, why am I writing about a new highway overpass in Mississauga here on I Bike TO? Well, because I like this bridge and I think it's a huge step up for cycling in Mississauga. If you take a look at the downtown / Square One area on the Mississauga Cycling Map, you'll notice that Highway 403 is a major pedestrian and cycling barrier that cuts straight across the northern edge of downtown. Prior to this bridge, the only crossings over Highway 403 were Hurontario St. (Highway 10) and Mavis Rd., both with nasty highway interchanges and huge volumes of fast-moving traffic. Safer crossing are located several kilometers east and west of downtown (Central Pkwy. and Creditview Rd. ), but those require huge detours to get where you want to go, and still are not as bike-friendly as they could be. The new Confederation Parkway bridge (almost) links several trails and bike lanes south of the highway to a series of designated routes, trails, and bike lanes north of the highway that go all the way to Brampton. Trying to ride any distance in Mississauga pretty much requires riding on major arterial roads, so connectivity in their bike network is extremely important. There are still many glaring gaps to fill in, but this bridge is a major win. Although the bike lanes are at least the 1.5m standard width, it would have been nice to squeeze in some extra room. Will snow and other debris be cleared? There's no room to push snow off the edge of the road because of the barrier between the bike lane and sidewalk. The north end needs to be extended a few hundred metres up to Huntington Ridge Dr., to connect with the signed bike route. Otherwise it just dumps cyclists out onto wide, busy road. The wide sidewalks (and lack of bike lane connection) will probably entice many cyclists coming off of the side streets to just ride on the sidewalk over the bridge. The other thing this bridge (and Mississauga in General) needs is more cyclists! I found it a bit disheartening to go for a 7km lunchtime bike ride around downtown Mississauga on a beautiful sunny day and see precisely ZERO other cyclists. Hopefully these incremental improvements will help get more bikes on the road. Overall, this is a big improvement for cycling in Mississauga. Crossing highways is a major concern for potential bike commuters at my workplace (and elsewhere! ), and any type of bridge without on/off ramps helps. I'd love to see more of these bridges appear over the 403, 401, 427, 407, QEW, etc. Even better would be some nice bike/pedestrian bridges that connect quieter roads over the highways, to help avoid that car/truck funneling effect. Where would YOU like to see better highway crossings? For example, I remember riding down Pharmacy Ave. and thinking that this would be a perfect place to have a bike/ped tunnel or bridge to cross the 401. I have more photos of this bridge here. The Mississauga News covered this story too, and there's also a good thread about it over at the Urban Toronto Forums. 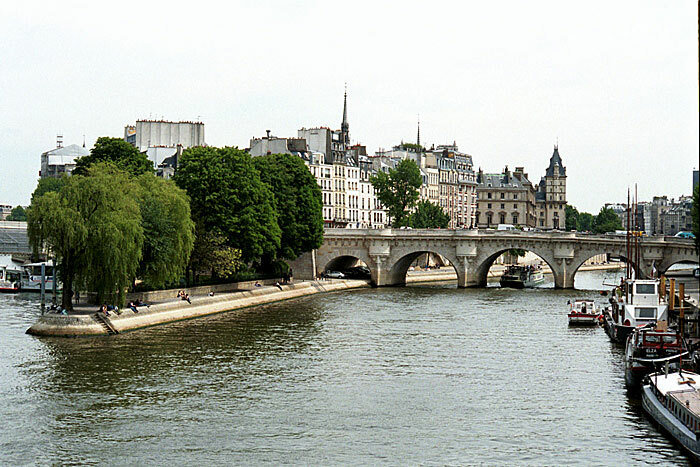 Well it aint the Pont Neuf, but yes, I agree: it's definitely a step in the right direction! The first positive feature of the bridge's bike lanes -- never next to door-zones! -- prompted a chuckle. 400 series highways, or rather their interchanges, are among the most daunting barriers to cycling -- I absolutely dread them. As you've noted the Coronation Pkwy. Bridge benefits by the absence of a 403 interchange, (Google Maps shows half-clover leafs on the main adjacent arteries, Mavis Rd. and Hurontario), with no diverging and converging traffic streams crossing cyclists' lines. I suspect this contributed significantly to the project's inclusion of bike lanes: not infringing on motorists' primacy is a major factor in deciding bikeways' viability. In Scarborough the most suitable -- that term applied with a generous measure of sarcasm -- cycling transits across the 401 are also those without interchanges, those such as Don Mills Rd (6 lanes and high speed, nearby the Betty Sutherland Trail offers passage beneath 401), the Birchmount Rd. underpass, the Midland Ave. underpass, and Progress Ave. (has an 401 on-ramp, and much truck traffic), etc... None of the above have bike lanes. Forget about the dozen or so other central GTA arteries with 401 interchanges. There you head for the sidewalk or gear up for a white knuckle sprint. Who would have thought that Mississauga -- of all places, God bless Hurricane Hazel! -- would leap frog ahead of Toronto and build a bridge affirming that deviants such as cyclists and pedestrians have the temerity to exist. It doesn't take much, does it? Yes, there is hope. What next, segregated bikeways in Vaughan? Oh, look at whole street. One that works for everybody. I like! Any north-south route in Scarborough would be greatly useful. The Toronto bike map has nothing that can get me from the Lakeshore GO line to north of the 401 without going very far out of my way. It's already a tough climb uphill over the highways and railroads, and the on-ramps make it terribly dangerous. I live in Agincourt and I understand the problem. Even the newly opened Pharmacy lane will help little since it won't take you over the 401 (Warden or Vic Park are pretty lousy for a cyclist). I keep using Brimley (the 401-overpass is a bit hairy, though and one has to be quite astute to do it in rush hour traffic) or as second choice, Birchmount (a thousand trucks can't be wrong, eh?! ).